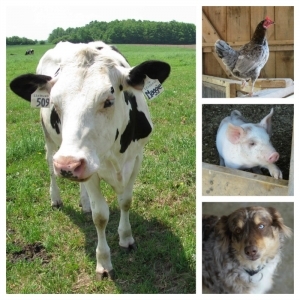 At Mapleton's we maintain an organic vegetable garden to supply our family and on farm restaurant with fresh produce. 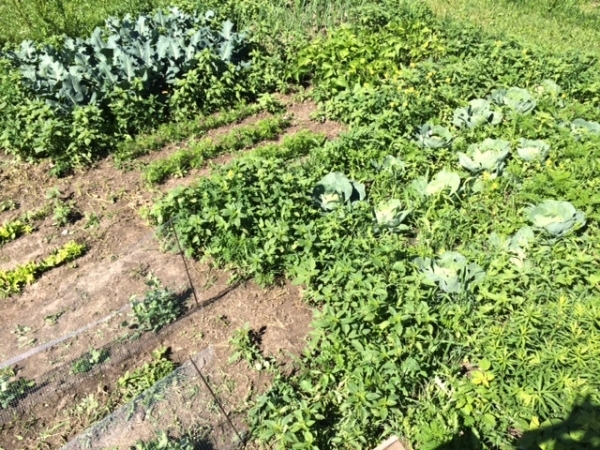 This year our garden includes peas, beans, broccoli, lettuce, tomatoes, cabbages, onions, cucumbers and peas.Our garden also includes weeds. Crab grass, burdock, thistles, prickly lettuce, lambs quarters and pigweed are common. As an organic farm, we don't use chemicals to battle the weeds. Instead we rely on the hard work of our staff to keep the weeds under control. Wrestling and tugging hard on weeds to get them out can leave you with a back injury and sore hands. Weeds may also snap off, leaving the root in the ground ready to grow again. If the ground is really dry and tough, water the ground for a few minutes to loosen the soil. Pulling weeds without gloves can leave your hands stained, sore and dry. Gloves can help reduce scrapes and damage to your skin. In some cases where we are pulling small weeds or fiddling with pulling roots we may take them off. 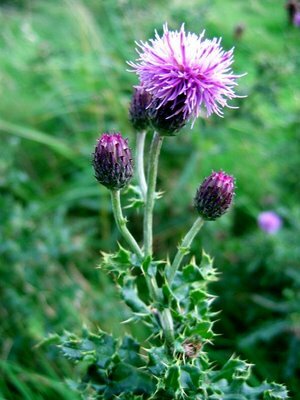 For our thistles – gloves are a must! To hoe or not to hoe? Using a hoe can make quick work of weeding and is well suited to gardens like ours that is planted in rows. It also is easier on your back because you don't need to bend over as much. On the downside, when you use a hoe you often don't get as much of the root and there is a higher risk you may chop out one of your vegetable plants. 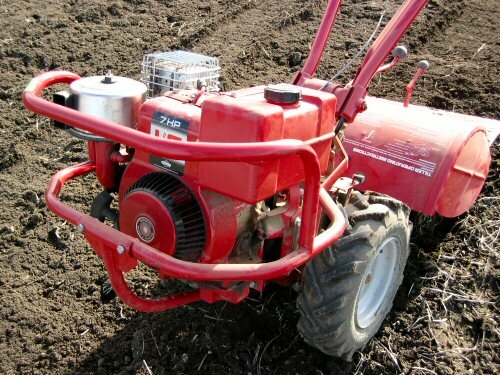 Using a mechanized tiller can help you turn the soil over a larger area more quickly than if you use a shovel. 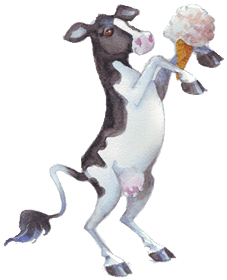 At Mapleton's we rent a tiller at the beginning of the season to mix manure and compost into the soil. Keep in mind, that using a tilling device often requires quite a bit of strength and stamina as many are heavy and still rely on you to keep them heading in the right direction. We've also found that in tighter areas, such as in our greenhouse it's best to focus on the basics and use a shovel, our muscles and some stamina. In wet soil it's easier to disturb the roots of your vegetable plants as you pull weeds. You can also cause damage to the soil by compacting it. This is especially true if you are using a mechanized tiller. Once soil is compacted it makes it harder for plant roots to grow. Although your garden will need more weeding in the beginning, continue to regularly weed your garden throughout the season. At Mapleton's in the spring the garden is often weeded one to two times per week. In late summer as the vegetables are larger and more established this is reduced to one time every two to three weeks. 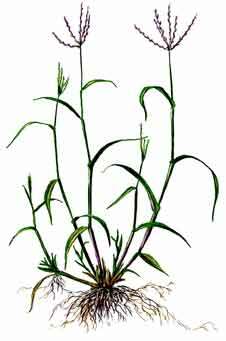 We find crab grass to be especially challenging in the garden. It loves to branch out and we try to take some extra time with this weed to pull out the roots. You'll never get it all out, but try to get as much of the roots as possible. Why don't we like weeds? In our garden, our focus is on growing vegetables. Weeds compete with our vegetable plants for moisture and nutrients. Subsequently, it's pretty important for us to keep them under control. We do encourage you though to investigate different ways to control weeds. Depending on the size of your garden you might also want to investigate permaculture concepts and ideas such as square foot gardening.